Our main research interest is in the study of stem cell extracellular microenvironments (ECM). A critical component in the recapitulation of tissue development and regeneration, the ECM contains morphogenetic signals via its biophysical environment. To harness such benefits of ECM for regenerative medicine applications, the morphogenetic signals provided via the biophysical ECM environment must be fully defined and decoded. While the effects of individual macromolecules on progenitor or stem cells have been well-documented, the impact of a complex ECM platform is much less understood, particularly due to a lack of a proper model. To address such shortcomings, we utilize cell-derived extracellular matrix (CDM) as a research tool, in which naturally-obtained CDMs are prepared and evaluated for their ability to induce multiple relevant biological phenomenon. The investigation of multi-lineage differentiation of mesenchymal stem cells and that of vascular morphogenesis of endothelial cells are some examples. Meanwhile, these matrices are chemically modified either for growth factor delivery or for tunable matrix stiffness. For instance, a heparin-conjugated matrix acts as a delivery carrier of vascular endothelial growth factor for angiogenesis applications. Furthermore, since varying ECM stiffness can trigger different cellular responses, various cell types - including embryonic stem cell (ESC) and ESC-derived cardiomyocyte - are subjected to specific biomechanical environments. 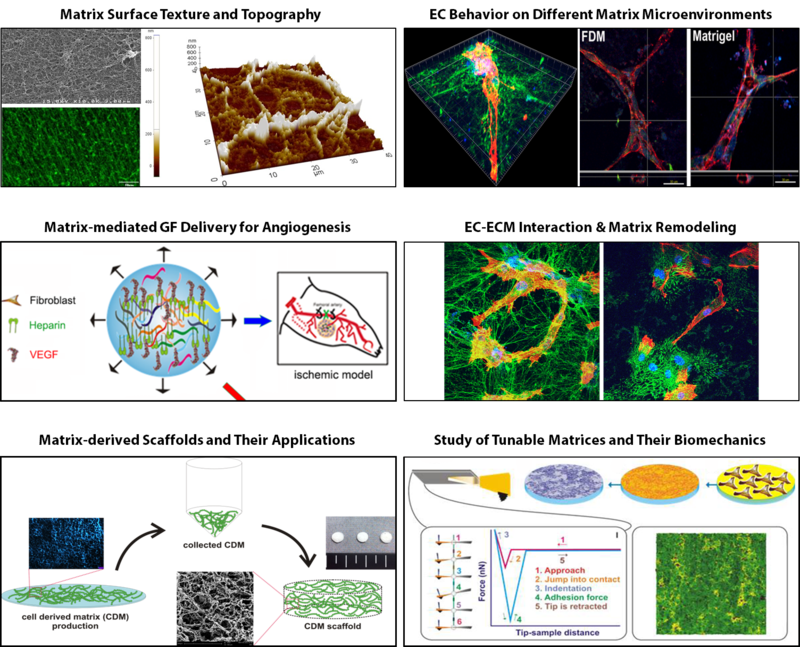 These studies will significantly enhance our understanding of cell-matrix interactions and generate valuable information of how cells respond on finely-controlled biophysical and biomechanical microenvironments.